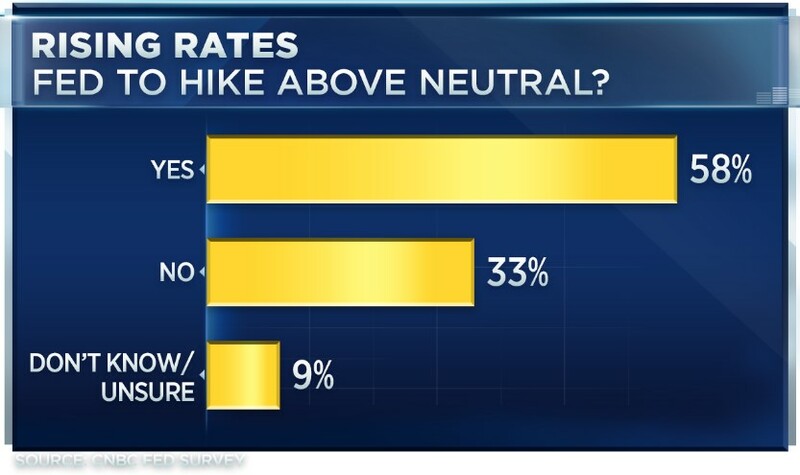 "Fed funds increases in September and December are as certain as certain can be," John Donaldson, director of fixed income at Haverford Trust, wrote in his response to the survey. "Their real challenge starts after the first increase in 2019, which will bring the rate to 2.75 percent, or finally back to even to inflation." 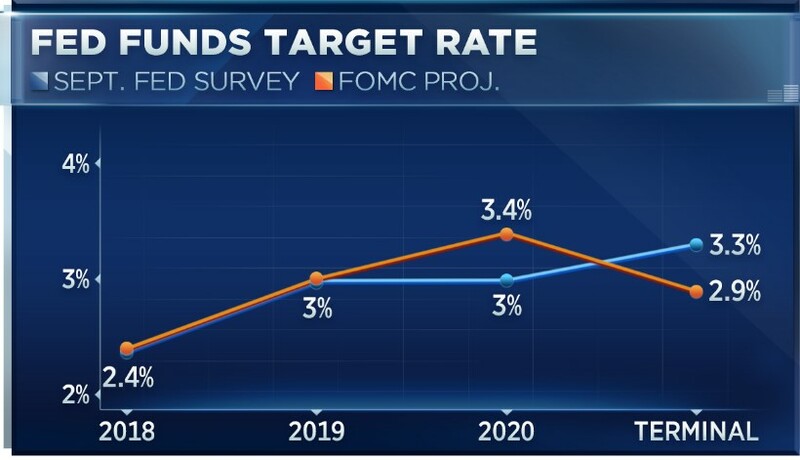 "This means that the U.S. bond market will reach a decision point sometime in the next year, when market participants will have to decide whether the Fed will go beyond current market pricing,'' said Tony Crescenzi, executive vice president at Pimco. "If and when it does, U.S. Treasuries will move higher." A fifth of the group say a "fed policy mistake" is one of the biggest threats facing the expansion, second only to trade protectionism. "We are in jeopardy of watching trade and monetary policy plunge into a head-on collision, with no one wearing seat-belts, and the airbags have been disabled," wrote Art Hogan, chief market strategist at B. Riley FBR. "The biggest risk in the market is a policy mistake, and we are working on a two-for-one special." Respondents support President Donald Trump's handling of the economy by a 61 percent to 30 percent margin, unchanged from the July survey. But 59 percent say his trade policies will reduce growth, and 52 percent say they will lower employment in the U.S.
A slight 53 percent majority also say the president's negotiating tactics will lead to better trade agreements for the U.S., while 20 percent say they will be worse and 22 percent expect them not to change much. "The president should be remembered for his cuts in regulations that served the economy so poorly for years but instead will be remembered for his illogical, un-economically justifiable support for trade protection and tariffs. How sad is that?" wrote Dennis Gartman, editor and publisher of The Gartman Letter. "Rarely are so many economic gauges of the U.S. economy so strong — including employment, income, retail sales, business spending, manufacturing and small business," wrote Jack Kleinhenz, chief economist for the National Retail Federation. "The near-term outlook appears to be steady as she goes." Correction: This story was revised to correct the GDP growth forecasts from the survey respondents.